Javier Ruiz de Larrinaga, 12 times a World Cup champion, has officially said goodbye to cyclo-cross in his town hall before more than a hundred people. 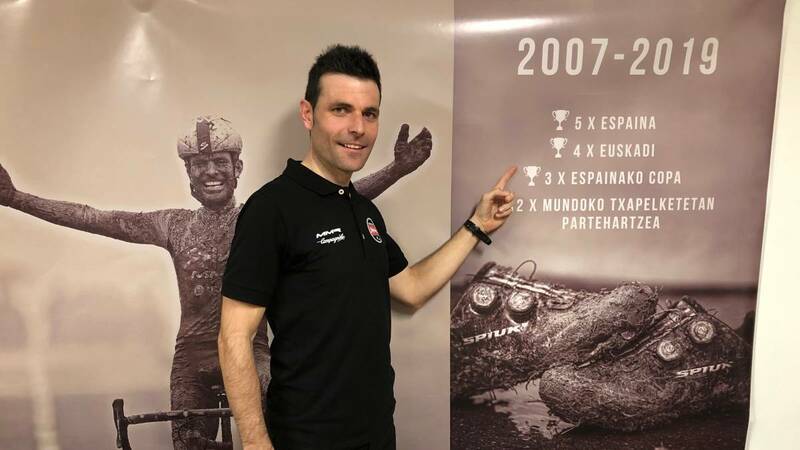 Cyclocross runner Javier Ruiz de Larrinaga officially said goodbye to his professional career at the town hall of Zuia, located in the Alava town of Murgia. Surrounded by more than a hundred people commented: "It's a very special day for me but also quite complicated. I made this decision in summer because I am 39 years and 13 seasons behind my back and I thought it was time" . For the The future said he expects to "remain linked to this sport". "It was clear that my intention was to run many races last year at home, I also wanted to do the World Cup tests for Christmas. And, logically, the Basque and Spanish championships that allowed me to run the world championships afterwards "After thanking everyone for their support, he left the multipurpose room of the City Hall after a standing ovation and tears of emotion, he remembered the Zuyano Cycling Club where he started, from his family, the clubs he belonged to. , trainers, sponsors, amateurs, their training groups, federations, friends from Belgium, media, their rivals, friends, brothers Beloki (present) and Isasi (also at City Hall) . Javier Ruiz de Larrinaga won five Spanish championships, four from Euskadi, three Spanish Cups and took part in 12 World Cups. The former exciter was also a professional I walk with the Navarre Kaiku. In the last seasons it competed in the route campaign with the Lizarte.